Advantage Hyundai body shop and collision repair center is a dealer preferred collision repair center in the greater New York area. We have built our business exclusively on reputation, great track record and dealer referrals. Nobody ever wants to be involved in any type of auto accident or deal with the stress and hassle it may bring. We pride ourselves on our ability to turn your bad experience into a positive, no hassle, stress free situation. If you are ever involved in a car accident, call the Advantage Hyundai Collision Center as soon as it happens. We will tow your vehicle, get you a courtesy vehicle and manage 100% of your insurance claim. The collision repair center at Advantage Hyundai employs expert auto body repair technicians. Our collision center has state-of-the-art equipment, instruments, and tools to keep up with the ever changing technology and auto repair processes. No matter what car, truck, van or SUV you have, we have the right tools and trained staff to have your vehicle looking brand new again and getting the job done correctly the first time. Put your trust in our body shop and we will make your accident seem like it almost never happened. We will have your vehicle returned looking like new and you will have the confidence knowing it was restored to factory conditions. Our promises to each and everyone of our customer's are simple. We want to have your vehicle back on the road in a timely fashion with repairs that are 100% correct while ensuring safety once again. 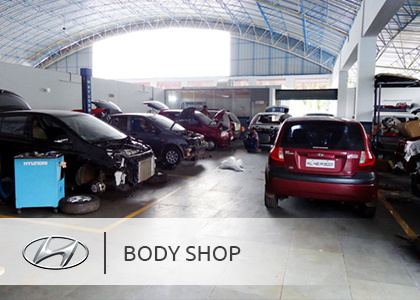 We have the dedicated staff, latest technological tools and body shop machinery to work on any make and model. Their is no collision repair we cannot handle, when we are finished with your vehicle you would not even know it was in an accident. Advantage Hyundai's body shop takes customer service one step further then everyone else by offering unrelated damage forgiveness when you bring your vehicle in. This means not only will we repair the damage to your vehicle caused by the accident, we will also fix the dents and scratches that were on it prior to the accident. This unique service gives each customer the reassurance and satisfaction of knowing their vehicle looks like new again. Insurance companies often hire inexperienced personnel to do the adjustment claims. Often time things passed on or over looked with your insurance claim. When you bring your vehicle into the body shop, we want to ensure that you not only get the best service possible, but the best value possible as well. Our trained auto body staff has a great track record of getting our customer's what they are truly entitled to from their insurance coverage. With your permission we can talk with your insurance company and ensure that your vehicle is repaired with OEM parts and to 100% pre-loss condition. Their is not extra charge, this is a complimentary service we offer to all of our body shop customers. What people do not realize is when an insurance company tries to force you into using after market parts on your car, not only can if effect the performance of the car but the safety as well. Do not settle for low-end body shop repairs, call us first (844) 300-7757 and we can answer any questions you may have. No matter what time of the day or night you have an accident, call the body shop at Advantage Hyundai and we will be their for you at no cost. Being involved in an automobile accident is stressful enough, do not worry about your vehicle and let us handle everything for you. We will show up to the scene of the accident, arrange the free towing and make sure you get home safely. You can rest assured knowing our team with be working on your insurance claim. We will also set you up with a free courtesy vehicle to use while we repair your vehicle back to manufacturer specifications. Take a few deep breaths and try to remain as calm as possible. Check yourself first for injuries then those of any passengers in your vehicle. Do not worry about your car at this time, if you need immediate emergency service call 911. If the accident is minor, your car is moveable and you have no injuries move your car to a safer place to get out of the way of moving traffic to help eliminate having potentially more vehicles involved. Turn on your hazard lights (if they are still working). No matter the severity of the accident, call the police regardless. Never sign any documents or forms unless it is related to documents by the police. Do not tell the police or other driver's involved that the accident was your fault, even if you think it was. Also do not accuse the other drivers involved in the accident for being at fault. After an accident most people are shook up from the initial shock and remind yourself to only state the facts of the incident. Call the body shop at Advantage Hyundai so we can tow your vehicle in, begin your insurance claim, give you a courtesy vehicle and begin the process of repairing your vehicle to manufacturer standards.